In massive volumes of more than 3 billion pounds by lunchtime copper for delivery in September jumped to a high of 2.9795 a pound ($6,569 per tonne), up more than 3% from Tuesday’s close to the highest since end-November 2014. Copper’s 2017 year to date gains in percentage terms now top 18% and the red metal has recovered 54% in value after falling to six-year lows below $2.00 a pound in January last year. On the copper derivatives market hedge funds built long positions – bets on higher prices in future – to a new record high last week according to the CFTC’s weekly Commitment of Traders data. So-called managed money investors’ net longs now total over 112,000 lots, the equivalent of 2.8 billion pounds or nearly 1.3m tonnes worth around $8.3 billion at today’s prices. It shatters the previous peaks achieved mid-2014 when the copper price was above $3.20 a pound and represents the equivalent of $11.8 billion swing from 2016 second quarter net short position (bets that copper can be bought back cheaper in future) of 1.2 billion tonnes. 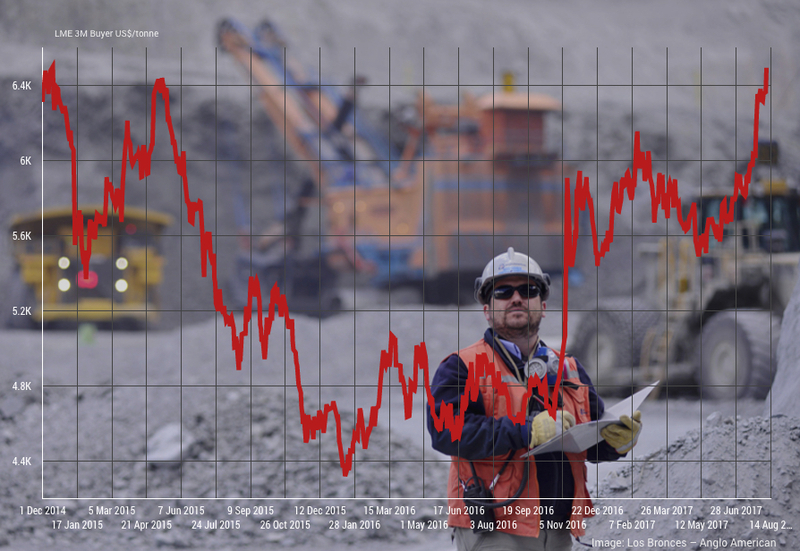 After a relatively uneventful supply environment in 2016, several outages at some of the world’s biggest mines including a 43-day strike at BHP’s Escondida mine in Chile which ended in March and ongoing strike action at Freeport McMoRan’s Grasberg operations in Indonesia have underpinned prices. Freeport’s temporary exporting licence is coming up for renewal in October, a bargaining chip used by Jakarta as it negotiates with the Phoenix-based company about divesting a majority stake in its Indonesian subsidiary. Zambia, Africa’s top copper producer, this week reduced power supply to mines operated by Glencore and First Quantum Minerals in the country over a pricing dispute. While Glencor’s Mopani was taken off line, the impact on FQM appears minimal at this stage – the power cuts coincided with a maintenance shutdown at Kansanshi and power supply had been redirected to the Canadian miner’s Sentinel mine. Last month Chile’s Antofagasta narrowly avoided labour strikes – which would have been the first in the London-listed company’s history – at its Zaldivar and Centinela mines in the South American nation. Together the two mines produce more than 280,000 tonnes of copper per year.